• 15”, 20”, 25”, 30” or 35” heat seal lengths. • Digital validatable temperature controller Full digital high speed PLC controller allows for customized seal programming, password protection of temperature, time and pressure, and Audible/text alarms. 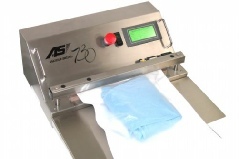 • Each heat sealer for medical packaging is validatable and NIST traceable. • Validatable Medical Heat sealer is pneumatically operated. • Stainless Steel finish ensures clean room compatibility.Nema4 rated stainless steel enclosures resist harsh anti-microbial agents..
Two year warranty - validatable medical heat sealers are made in USA.